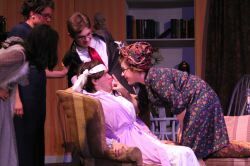 Mount Vernon High School took on a difficult assignment when choosing to perform Noël Coward’s Blithe Spirit, and for the most part the show was professional, polished and certainly amusing. Performing a somewhat dated show, the actors made this 1941 gem feel fresh and original. 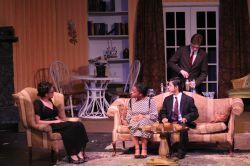 Coward’s Blithe Spirit centers around novelist Charles Condomine, who, in order to research for a book, invites a clairvoyant into his home. But when the clairvoyant, Madame Arcati, brings his first wife back into the mortal world, chaos ensues. Supernatural elements play a major role in this show, so special effects and tech are even more important. Mount Vernon’s show was anchored by strong acting across the board. Not only were the lead players admirable, actors in smaller roles excelled, especially Kodie Odalato (Edith). Some of the technical elements were extraordinary as well. Though set changes often took a bit too long, the tech crew made up for it with exceptional special effects in the last scene. Jerry Halstead (Charles) held the show together in somewhat of a straight man role, but he also came through with comedic reactions to the more eccentric characters. Darian Abenes, as the mysterious Elvira, delivered each line with confidence, enchanting the audience in her ghostly role. Kodie Odalato, as Edith, was an audience favorite, due to his cross-dressing and constant flustered state. Also, his physicality as a woman was very strong; he clearly worked to understand the mannerisms of an early 20th century maid. Technical elements in Mount Vernon’s show were excellent. The set was simple, but very good-looking. Small details like the bendable “wall” were very well conceptualized, adding to the audience’s understanding of the show. The costume crew, headed by Paul Aubuchon and Kodie Odalato, did a respectable job finding pieces that were period-appropriate and still fit the characters. Finally, the special effects team did a marvelous job creating believable supernatural elements, especially in act two. Mount Vernon High School’s production was certainly enjoyable. 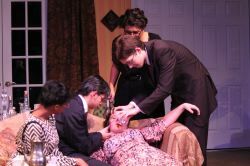 With the exception of a few scenes, the actors held the audience’s full attention, and executed plot twists with ease. The technical elements were integral to the show as well. 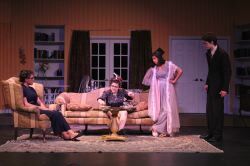 Overall, Blithe Spirit was a success; the audience left happy. This article can be linked to as: http://showbizradio.com/go/8293.